BE so, I might be a bit older than the target audience... 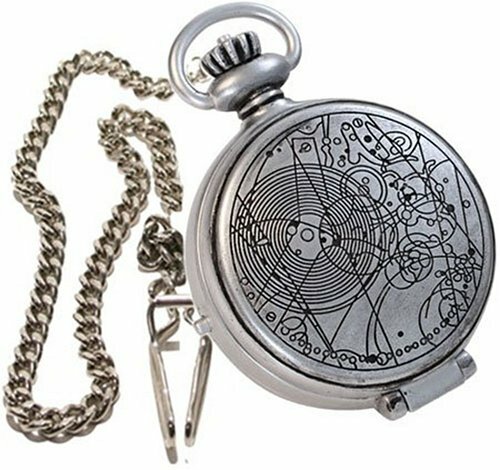 I bought a Time Lord watch :)... Still not a Time Lord. Even when I put the batteries in. :(... okay, so, yes, a toy. For ages 5 and up. I'm, er, up.It is plastic. Except for the chain. The chain makes the plastic look cheap. But does function to keep the watch where it is put, so that part works out. The case has patterns just like on the show, and seems fairly accurate. Same with the watch face. So that's nice. But the light effect is pathetic - I've got a better light on my keychain, and it doesn't light the center of the watch at all. And the sound effect happens whenever you make the light, so it isn't much use if you, for instance, want to know the time in the cinema. Plus it sounds like the Doctor only if the Doctor is talking through a comb after inhaling helium. Actually come to think his voice doesn't change when inhaling helium, so it's just out of character. Er, I mean, it sounds mostly like hsssh shhh crsshh and you can only tell what he's saying because we have it memorised from TV. Bit disappointing really.On the plus side - Time Lord watch! Wheeee!It, er, gets all its stars from that bit. Mr. H. T. Tennant "Buddhabhoy" Time for the Time Lords This was purchased as an extra for my son's Christmas stocking; and it has been a find wirth buying.Along with series 3 on DVD, the fob watch has completed his "wardrobe" as we now are fully fledged for acting out "Family of Blood" and "Last of the Time Lords".The only downside, is the quality of the sound that comes from the watch is poor to say the least, but it doesn't affect the fun factor for my son and his friends when playing.For all those parents with kids that dream of being an exile of Gallifrey, this is well worth buying. The return of The Master has been one of the many recent triumphs of Doctor Who. And with this, the final single DVD release of season three of the show, the three concluding episodes deliver John Simm’s majestic take on one of the Doctor’s deadliest and oldest enemies. These three episodes also see Torchwood’s Captain Jack Harkness rejoining the Tardis, and along with the Doctor and Martha, there’s a mighty battle to be fought. It all starts with “Utopia”, one of the very finest episodes of Doctor Who’s third season. This is a clever, slow-burning tale, with Derek Jacobi guest-starring, and it features a final ten minutes so good it’s enough to make Who fans weep. Things continue with some style in “The Sound Of Drums”, where The Master really comes into his own, replete with a devastating cliffhanger to set up the season finale. And ironically, it’s that finale, “The Last Of The Time Lords”, that’s the weakest of the three here, a slightly muddled–but still very enjoyable–wrapping up of a very strong series. Charles "mrfreedom" Mind blowing and spine tingling The epitome of all that Russell T Davies has achieved in his time on the show, this DVD deserves a place in your collection. The three episodes are all stunning in different ways. They're fast, funny (in places), moving, look spectacular and contain several brilliant performances, particularly from David Tennant and John Simm. They achieve a real sense of drama that matters and the cliffhangers succeed in putting the Doctor in situations where you think 'How can he POSSIBLY get out of this one?! 'One reviewer on this page says: 'It's hardly The Daemons'. No, it's not. It's a thousand times better than that Jon Pertwee story in every conceivable way: plot, dialogue, acting, special effects, just general FEEL, everything. Celebrate the apex of this wonderful TV series. Recreate scenes from Doctor Who with these detailed 5″ action figures. Vast range of other Doctor Who figures and memorabilia available. Another awesome figure by character options that captures the likeness of the Master very well.Perfect for any young Doctor Who fan. Highly recommended! Definitely a must for dr who fans, a durable & sturdy toy which has survived being thrown about & played with by a boisterous 7 year old. Worth the money. Paul Tapner McCoy his darkest I bought this audio because I had heard from a reliable source that Master was good. Master was not good...It was excellant! I could not turn away from this brilliant epic. I wish not to spoil the storyline for anyone, but I will say that it is for any Master fan. This story is very dark and even quite scary in places. It is more of a psychological thriller than a science fiction story. I urge all who read this to buy it. I repeat: BUY IT! Recreate scenes from the Classic Series of Doctor Who with this figure of The Master . 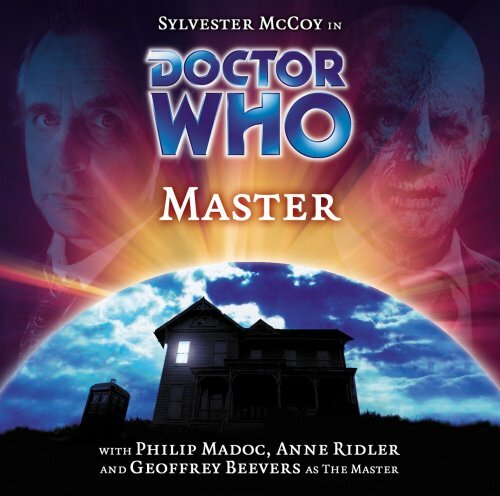 The Master is a renegade Time Lord, and the arch-enemy of the Doctor. 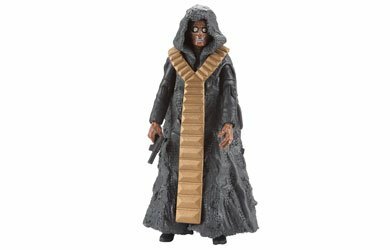 This figure shows him as he appeared in ‘The Deadly Assassin’ in 1976, near the end of his final life. He stands posed and ready to shoot all that defy him. Doctor Who Classic Figure – The Master is great for fans of Doctor Who, both old and new.